Insider Inspiration: "Getting Your SKIN Event Ready"
First, Jamie received Botox, which is consistently one of the top five nonsurgical procedures performed each year. In addition to glabellar lines, Botox is used to minimize crow’s feet, frown lines and furrows in the forehead. Botox blocks the release of a chemical called acetylcholine which triggers the muscle contracts that create wrinkles, thus essentially paralyzes the muscles and stops them from contracting. Results are visible within one week after treatment and remain for a minimum of three months. With Botox, it is important to make sure that you consult a qualified doctor before having it done. Many types of physicians perform Botox injections, including board-certified plastic surgeons, dermatologists and facial plastic surgeons. These shots require a precise knowledge of facial anatomy. Make sure you do your research and use a qualified physician! Next up, Jordan received the HydraFacial MD, a treatment that has been gaining popularity in the spa industry and has been featured in many trade publications. The HydraFacial MD was performed on the reality show The Real Housewives of Beverly Hills and was also demonstrated on the show The Doctors in an episode declaring water as the No.1 secret to living longer and looking younger. The facial has also been featured on various news channels as an effective anti-aging procedure. 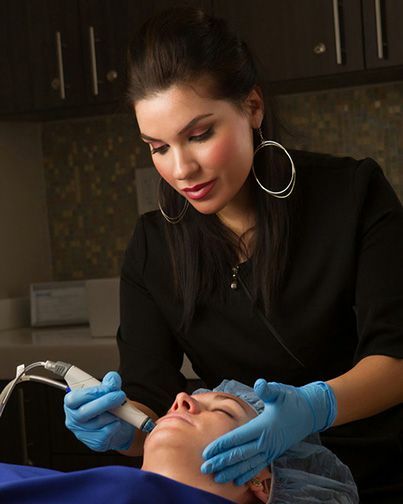 The HydraFacial MD treatment cleanses and exfoliates while simultaneously hydrating skin and is known to be quick and painless, usually with immediate, visible effects after one treatment. It is designed for all skin types and treats a variety of skin issues, including acne, fine lines and hyperpigmentation. There is no skin irritation or downtime and the smoothness and hydration usually last five to seven days. Because the effects of the HydraFacial MD are immediate, it is the perfect treatment prior to a wedding or other special event.